news and strategies for the evolving mortgage market 16 From Keyboard to Closing Bank of America's John Cross explains how homebuyers are utilizing technology. 18 Endorsing the eMortgage Many lenders have gone the "paperless" route, but is that really the same as a true eMortgage? 22 From Oversight to Insight By leveraging compliance departments, financial services companies can gain a competitive edge. 26 Ensuring Independence Lenders can benefit from using AMCs, which offer compliant, autonomous, and unbiased appraisals across the country. 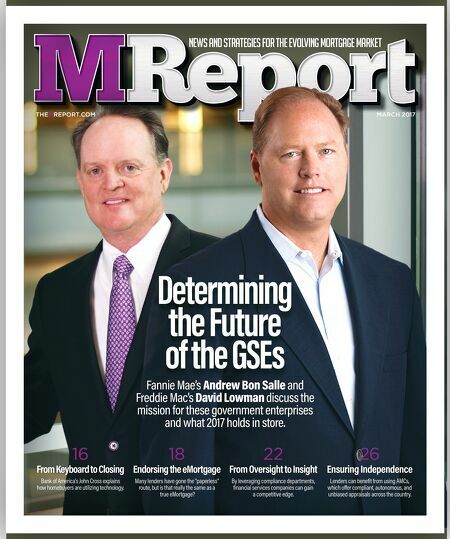 MARCH 2017 THEMREPORT.COM Determining the Future of the GSEs Fannie Mae's Andrew Bon Salle and Freddie Mac's David Lowman discuss the mission for these government enterprises and what 2017 holds in store.